For many cannabis users, whether you are smoking out of a water pipe, glass bong or oil rig, making sure your that your glass is clean is a necessity. With time, any glass bong or pipe will accumulate tars and resins from cannabis flower, BHO or CO2 oils that are being consumed. Individuals who don’t clean their smoking accessories regularly can suffer from respiratory and other health issues. Furthermore, dirty glass diminishes the ability to enjoy cannabis as it should be enjoyed! Cleaning your bong with salt and alcohol is by far the most popular method as many cannabis users aren’t familiar with an effective glass and bong cleaner like Kryptonite. While cleaning a glass pipe or bong with salt and alcohol works to a degree, there are many hazards that come with it – namely breaking your heady glass pipe or bong. With that being said, we still wanted to educate people on the correct way to clean a bong using salt and alcohol. The two main ingredients in your homemade bong cleaner are salt and alcohol. There are some people who even like to use vinegar and even mouthwash. Alcohol is the most popular of these choices, but it is also the most dangerous. Alcohol is highly flammable! Putting a flame to a pipe or glass bong (i.e. – right after you clean it) is never a good idea! That being said, the best salt to use is Iodine-free table salt. Some smokers prefer rock salt which is generally bigger and may not reach all nooks and crannies in most intricate glass pipe or bongs. Also, having a bunch of rocks shaken around within your glass bong may not end well (Kryptonite’s cleaner is clay-based and has no debris in it like salt or other abrasives). Once you’ve obtained your salt and alcohol, pour about ½ cup of salt through the top opening. If you water pipe or glass bong has percolators, you’ll also want to add about ½ cup of salt into the lower opening. This assumes an 18 inch water pipe or glass bong. If your pipe bigger or smaller than 18 inches, adjust the amounts appropriately. To complete the solution, pour in twice as much isopropyl alcohol (ex. ½ cup of salt, use 1 cup of alcohol. Always use a 2:1 ratio of alcohol:salt). For the cleaning solution to stay contained within the water, you need to cap the upper and lower openings of your bong. A common method of doing this is with one hand on the upper opening and your thumb on your other hand on the lower opening. Once the openings are sealed, violently shake your bong. By shaking your bong, the salt is supposed to remove the built up tars and resins from it. The harder and longer you shake, the cleaner your bong will become. Be careful though! Plenty of heady glass pipes and bongs have been broken by using a household cleaner like salt and alcohol. That’s why we always recommend Kryptonite glass and bong cleaner, which never requires you to shake whatever you are cleaning! It should also be noted that if you’re using salt and alcohol to clean an acrylic bong, it scratch your bong! This is because the plastic is soft and the salt is an abrasive (similar to sandpaper). In commercial products like Formula 420 cleaner, which is 97 proof alcohol, salt and they also add the legal limit of D-Limonene, which in most states is 3%. Find out more about what D-Limonene and the hazards of using products containing D-Limonene here. Klear Kryptonite has been featured by HotBox Magazine as on of the Top 10 Products That Keep Your Bong Clean. Salt and alcohol are the two main ingredients of most bong cleaners on the market today. Salt is used as an abrasive, similar to sand paper. As you violently shake your bong when cleaning it with a salt-based solution, it can and will scratch the glass. This is why older bongs seem to get dirty faster as the tar and resin build up in the grooves caused by the salt-based cleaning solution. Now that you have vigorously shaken your bong, pour new alcohol/salt solution which you cleaned your bong with into the sink. Thoroughly rinse your bong with plenty of warm water while rinsing your sink. Please do a thorough job as alcohol is highly flammable. Have you ever seen a blue flash after you’ve cleaned your bong? Many individuals using alcohol-based cleaning solutions see this during their first hit? This blue flame is the leftover alcohol from the cleaning solution igniting when a flame is placed to your bong. This can be very dangerous, especially if you haven’t thoroughly rinsed your glass after using alcohol-based solutions! 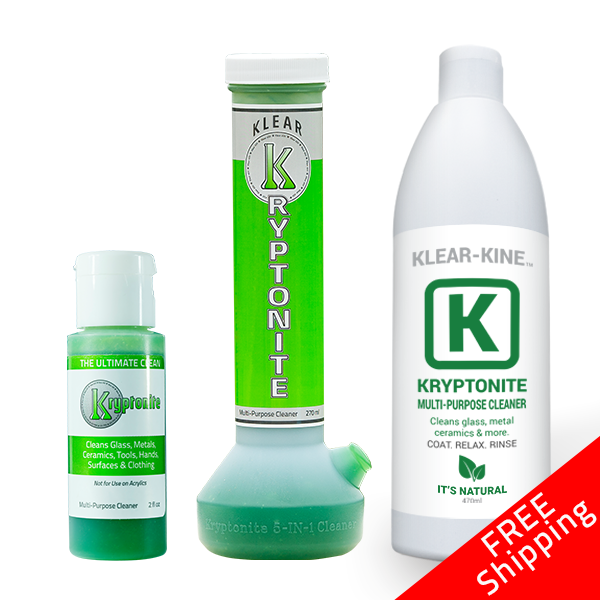 The entire line of Klear Kryptonite cannabis accessory cleaners are clay-based and will never ignite as they are all non-flammable! After you’ve completely washed out all the rubbing alcohol from your bong, set it safely to the side. It’s time to wash your sink. You’ll probably want to do this immediately after, especially if you’re cleaning your bong at your parent’s or in-laws house! They may not appreciate their entire kitchen or bathroom smelling like bong water. A significant amount of Comet, a brillo pad and serious elbow grease should be able to remove the dirty bong water smell out of your sink. Instead of wasting your precious time trying to scrub the tars and resins out with Comet and alcohol, you can just get Kryptonite’s Original Formula from our online store, clean in in less than 10 minutes and leave a fresh spearmint smell behind!